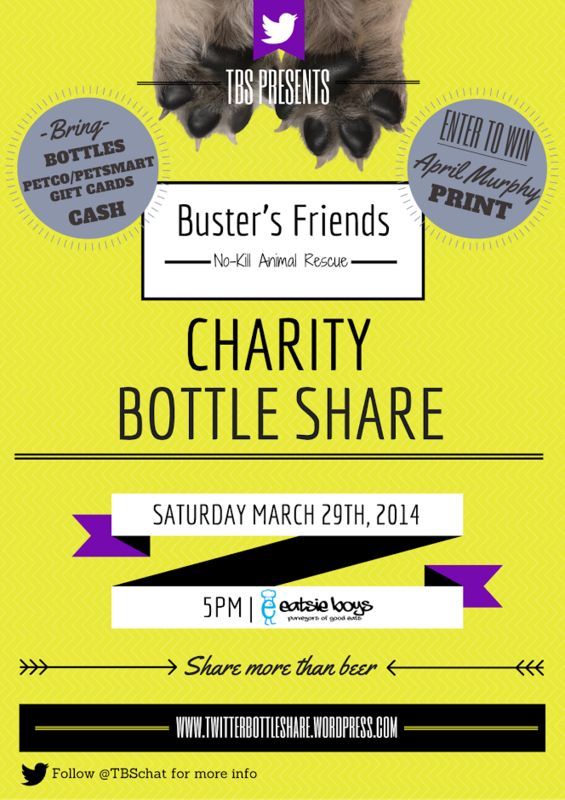 The fine folks at Eatsie Boys are opening their doors to host our TBS Charity Bottle Share. If you’ve never been there…come hungry! Their menu is out of this world. I mean, breakfast all day?! Yes please. Just check out these pictures if you don’t believe us! Remember, buying food supports Eatsie Boys, who is supporting TBS! Join us for the first official Charity Bottle Share presented by @TBSChat and benefiting Buster’s Friends No-Kill Animal Rescue. Grab your bottles and get ready to help. We ask that everyone make a minimum $10 donation. Bring cash. If you’re interested in buying raffle tickets or cookbooks, please bring cash to make the purchase easier. Drink water. Remember to hydrate while enjoying the share. Be present to win. We will be drawing for the raffle about 7-7:30, and you must be present to win! Buy food. Eatsie Boys is a huge TBS supporter, so TBS needs to be a huge Eatsie Boys supporter! If you haven’t eaten there before, it’s a treat! Bring a Petco, Petsmart or credit gift card! Buster’s Friends Rescue Group keeps all of their animals on a strict diet. Donating gift cards instead of miscellaneous items allows us to support their cause without making any of the animals sick! Buy Buster’s Friends merch on site! Angela from Buster’s Friends will be at Eastie Boys on the day of the share selling Buster’s Friends cookbooks for $20 and coloring books for $10. Pay with cash, check or credit/debit card. 100% of the proceeds benefit our furry friends at BF. Enter to win our raffle giveaway! Prizes include an April Murphy/AEM Gallery art print and other surprise prizes craft beer drinkers will be sure to love! Raffle tickets are $2 each or 6 for $10. Bring cash and get ready to win. If you can’t make it, you can still make a donation to Buster’s Friends! Clicking the Paypal button below will take you to the Buster’s Friends website where you can click the DONATE button on the left to make your donation. When you make a donation through Paypal, just put TBS Charity Bottle Share in the “Purpose” box so that we can keep a tally on how much our great group has donated! Categories: Uncategorized | Tags: charity | Permalink.